Mak Studio created the tikis on the wall at Kanaloa, downtown's tiki bar, opening September 5. Photo courtesy of Tyler Barrera of Kanaloa. When Kanaloa opens the doors at 311 Travis on Wednesday, September 5, it’s not going to be like the other bars in Downtown’s Market Square. Instead, it’s the culmination of what managing partner Tyler Barrera calls “an education in all things tiki.” He says the “big learning curve” including figuring out which rums to stock, the cocktails that would make it to the menu and which versions of the drink recipes to use. Barrera also wants to ensure visitors to the new bar know that Wednesday is the soft opening. Kanaloa is waiting on some additional touches — like the rest of its patio furniture — before throwing a big opening bash. That is likely happening later this month or early October. However, he says the bar crew is ready. They’ve been perfecting a dozen classic tiki cocktails including the Zombie, the Fog Cutter and the Mai Tai. The bar has also given Houston food truck Oh My Gogi free reign in the kitchen. Menu items include a series of “tiki tots” including jerk chicken (seasoned grilled chicken, mozzarella cheese and pineapple pico de gallo), Baja Shrimp (mozzarella, pico and guacamole). For vegans, there is “Beyond Baja Tots” made with plant-based protein, mozzarella, pico de gallo, cabbage and guacamole. There are also both grilled and fried shrimp tacos, a Korean salad and a Korean rice bowl. Bartenders at Kanaloa lend their skills to creating classic tiki cocktails such as the Mai Tai, the Zombie and the Fog Cutter. “And, because it’s Houston, we’ll be bustin’ out the blender to make piña coladas,” said managing partner Tyler Barrera. Photo courtesy of Tyler Barrera of Kanaloa. 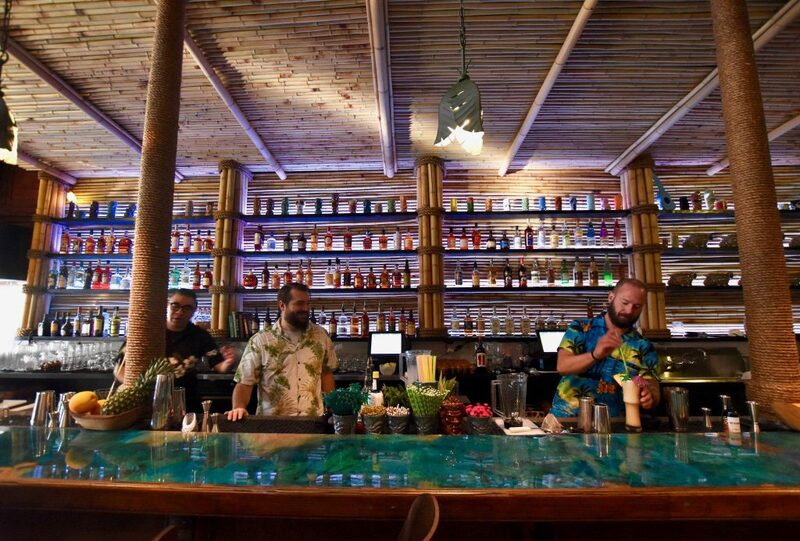 Barrera and his business partners Keith Doyle and Roland Keller, the team behind Wicklow Heights, wanted Kanaloa to be a place that would — like any great tiki bar — take drinkers out of the real world and into a kind of Polynesian fantasia. They called on Tikibosko to carve the tikis flanking the front doors and the wooden tabletops. 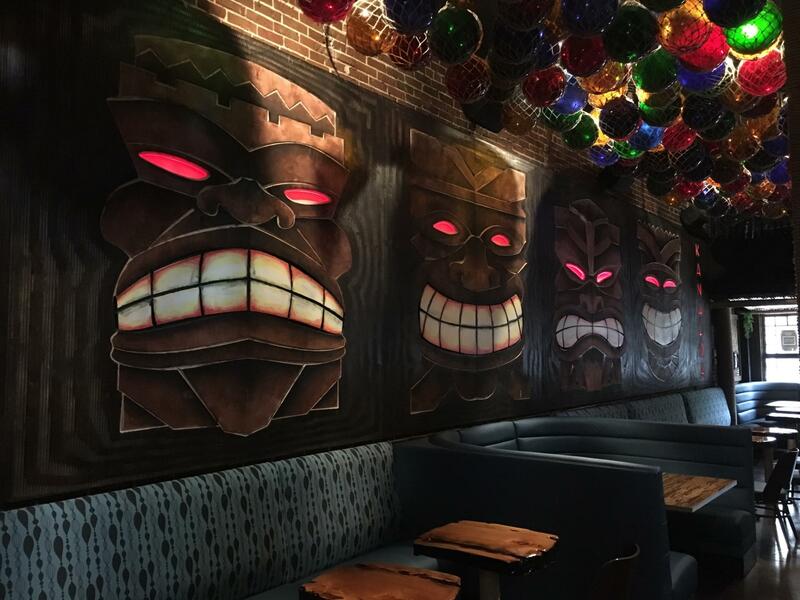 Māk Studio, the firm behind EaDo’s Chapman and Kirby, created the tiki faces on the walls. The stylish interiors, with deep blue hues, were the work of Leticia Ochoa’s Clover Design Studio. (If that name sounds familiar, it is because she also is a co-owner of Melange Creperie in the Heights.) The full effect should allow guests to feel they’ve been swept away. 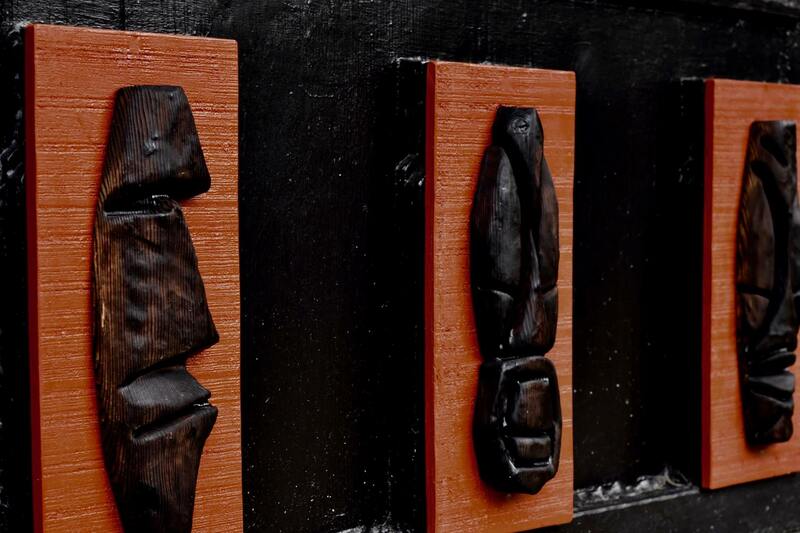 To find Kanaloa, look for the carved tiki faces. Photo courtesy of Kanaloa. At last weekend’s friends and family event, Barrera said he loved watching the bartenders working together to mix the fanciful, multi-ingredient cocktails. He said the entire Kanaloa team is coming together to build an experience he hopes will give guests a slice of adventure. Kanaloa opens at 4 p.m. on Wednesday, September 5. Regular hours are Tuesdays through Fridays from noon to 2 a.m., Saturdays from noon to 3 a.m. and Sundays 2 p.m. to midnight. My friends and I couldn’t wait to see the inside of Kanaloa. We were pretty surprised by how tasteful the decor is. This place is beautiful, not kitschy or garish at all. Very classy! There were still plenty of people in ‘street clothes’ so we weren’t out of place. And we were all more than pleased with our drinks! Definitely recommend.